This volume contains the contributions presented at a short course held in Golden, Colorado, October 25-27, 1996 in conjunction with the Mineralogical Society of America's (MSA) Annual Meeting with the Geological Society of America in Denver, Colorado. 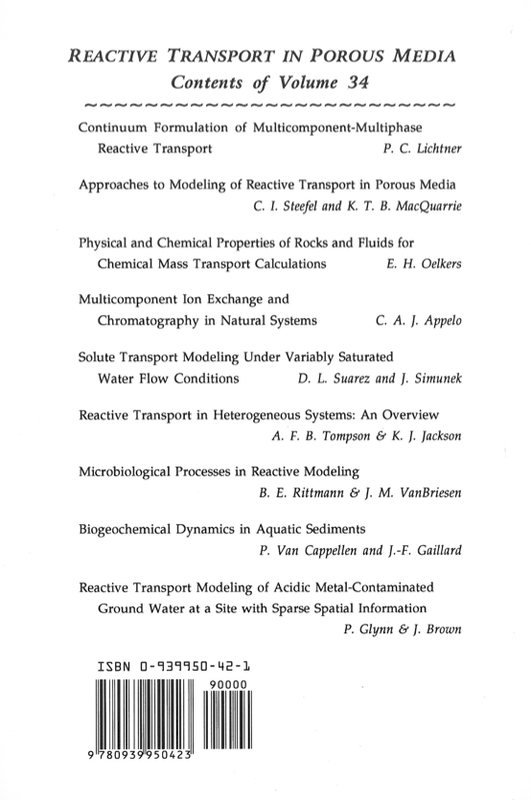 The field of reactive transport within the Earth Sciences is a highly multidisciplinary area of research. The field encompasses a number of diverse disciplines including geochemistry, geology, physics, chemistry, hydrology, and engineering. The literature on the subject is similarly spread out as can be seen by a perusal of the bibliographies at the end of the chapters in this volume. Because these distinct disciplines have evolved largely independently of one another, their respective treatments of reactive transport in the Earth Sciences are based on different terminologies, assumptions, and levels of mathematical rigor. This volume and the short course which accompanies it, is an attempt to some extent bridge the gap between these different disciplines by bringing together authors and students from different backgrounds. A wide variety of geochemical processes including such diverse phenomena as the transport of radiogenic and toxic waste products, diagenesis, hydrothermal ore deposit formation, and metamorphism are the result of reactive transport in the subsurface. Such systems can be viewed as open bio-geochemical reactors where chemical change is driven by the interactions between migrating fluids, solid phases, and organisms. The evolution of these systems involves diverse processes including fluid flow, chemical reaction, and solute transport, each with differing characteristic time scales. This volume focuses on methods to describe the extent and consequences of reactive flow and transport in natural subsurface systems. Our ability to quantify reactive transport in natural systems has advanced dramatically over the past decade. Much of this advance is due to the exponential increase in computer computational power over the past generation-geochemical calculations that took years to perform in 1970 can be performed in seconds in 1996. Taking advantage of this increase of computational power, numerous comprehensive reactive transport models have been developed and applied to natural phenomena. These models can be used either qualitatively or qualitatively to provide insight into natural phenomena. Quantitative models force the investigator to validate or invalidate ideas by putting real numbers into an often vague hypothesis and thereby starting the thought process along a path that may result in acceptance, rejection, or modification of the original hypothesis. Used qualitatively, models provide. insight into the general features of a particular phenomenon, rather than specific details. One of the major questions facing the use of hydrogeochemical models is whether or not they can be used with confidence to predict future evolution of groundwater systems. There is much controversy concerning the validity and uncertainties of non-reactive fluid flow systems. Adding chemical interaction to these flow models only confounds the problem. Although such models may accurately integrate the governing physical and chemical equations, many uncertainties are inherent in characterizing the natural system itself. These systems are inherently heterogeneous on a variety of scales rendering it impossible to know precisely the many details of the flow system and chemical composition of the host rock. Other properties of natural systems such as permeability and mineral surface area, to name just two, may never be known with any great precision, and in fact may be unknowable. Because of these uncertainties, it remains an open question as to what extent numerical models of groundwater flow and reactive transport wilI be useful in making accurate quantitative predictions. 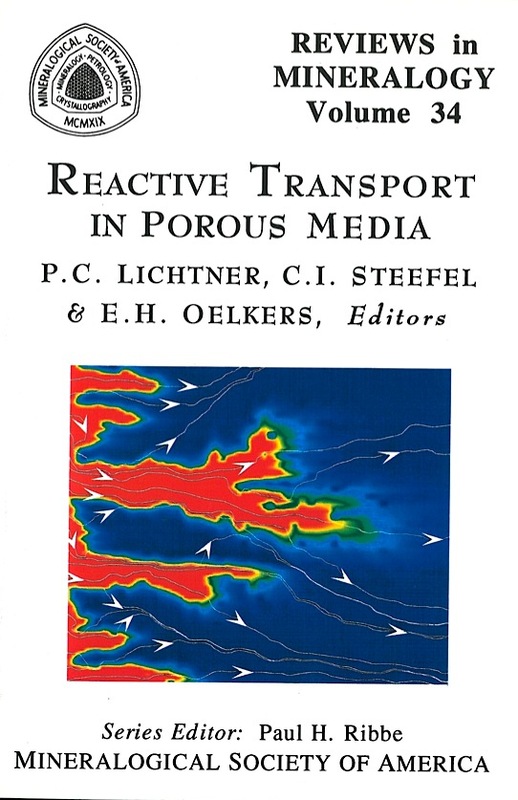 Nevertheless, reactive transport models should be able to predict the outcome for the particular representation of the porous medium used in the model. Finally, it should be mentioned that numerical models are often our only recourse to analyze such environmental problems as safe disposal of nuclear waste where predictions must be carried out over geologic time spans. Without such models it would be impossible to analyze such systems, because they involve times too long to perform laboratory experiments. The results of model calculations may affect important political decisions that must be made. Therefore, it is all the more important that models be applied and tested in diverse environments so that confidence and understanding of the limitations and strengths of model predictions are understood before irreversible decisions are made that could adversely affect generations to come.